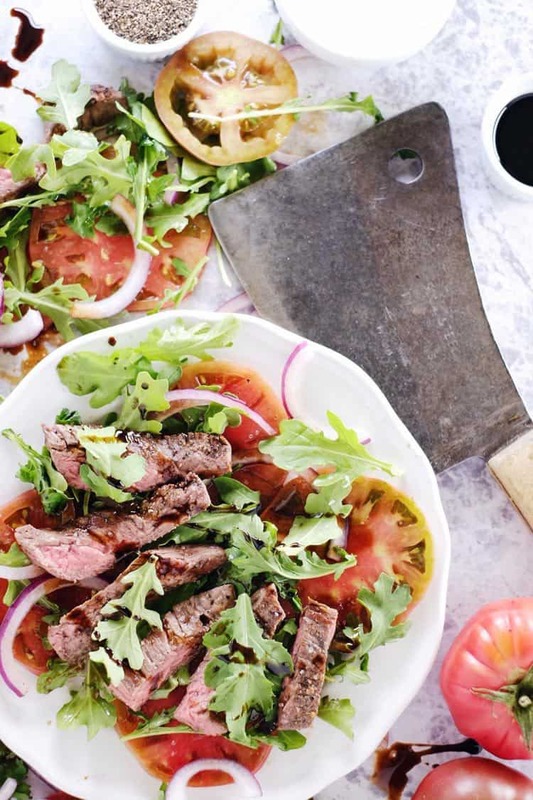 Heading back into the fall is always a good time to remember that simple is best, in cooking and life, and this simple steak salad is proof! There are just a handful of ingredients, with nothing flashy or obscure. Get ready to make a simple, nourishing, and delicious dish! I have always loved fall; there are just so many things to like. I love the weather and those cooler, crisp days with bright sunshine. I love pulling out my cardigans, scarves, and boots. Ok, I know…you’re thinking “Erica, you wear cardigans all year long!” It’s true. I am a cardigan lover all year long, but I love fall and winter cardigans that are thicker and carry more texture and weight. Just writing about it makes me giddy! I also love getting back into a solid routine with the start of fall just around the corner. It means getting into regular meal planning again, and simple recipes like this one make life so much easier. I think my favorite cut of steak has traditionally been a flank steak. I love a thinner cut, and Justin does a great job of cooking it to the perfect doneness. However, over the past summer I really started to love skirt steak. It is another thinner cut, even more so than my beloved flank steak, and it so tasty. It has just the right amount of fat to give the steak a little extra buttery taste, but not too much. Are you already a fan of skirt steak? I feel it is often underutilized and appreciated, and it is totally worth your time to give it a try! Plus, it will save you a couple bucks compared to a flank steak too! Fall is almost here guys! 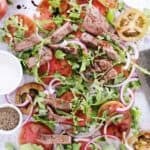 Make this simple steak salad for an easy, nutritious and delicious lunch or dinner as you get back into a routine. Let us know how it goes by leaving a comment below. Also, take a photo and tag us on Instagram @realsimplegood, so we can check it out! Heat a large skillet over medium heat and season steak with salt and pepper on both sides. You may have to use two skillets or cut steak to size and cook in batches. Once hot, place steak in skillet to cook, about 3-4 minutes per side depending on steak thickness and cooking preference. While the steak is cooking, cut up tomatoes and onion. Once steak is done, place on a cutting board to rest for a few minutes before slicing. Slice steak into small strips against the grain. 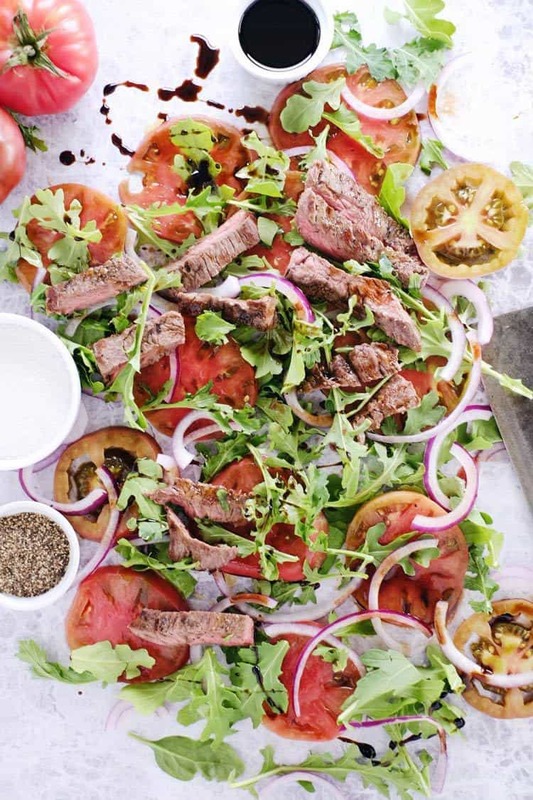 Prepare salad by adding sliced tomatoes and arugula to a plate. 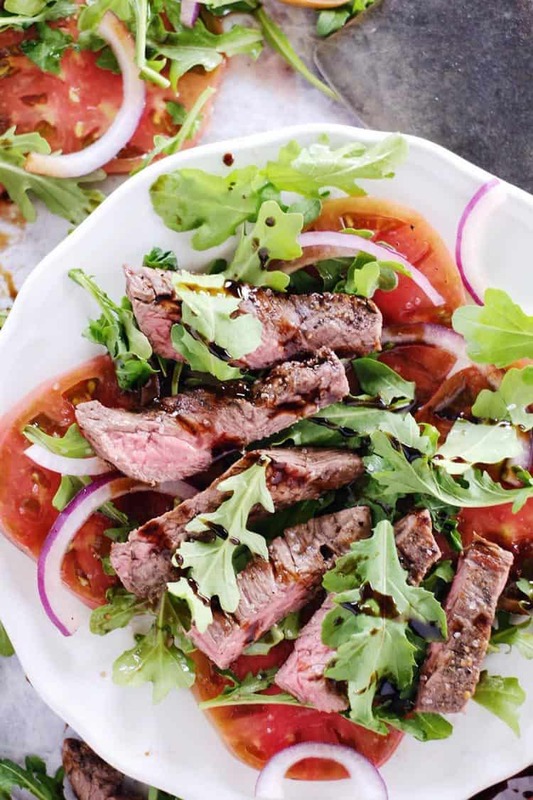 Top with sliced steak and drizzle with olive oil and balsamic. Sprinkle with additional salt and pepper if desired.